Pag nagkamali pa, its not the equipment, its me!!! But the budget only allowed to buy me an Imarflex Rotisserie, my friend Romzkee recommended it. The oven has an option for temperature which is crucial for most recipes. When I looked it up on a local online store, it was worth 2600PHP so I was happy to find one at Trinoma Ansons that costs 2100PHP. Yay! More money to spend on other basic utensils like measuring cups, spoons, wax paper and pans! So, I came home with all of these, instead of new bag or shoes, signs of aging? My new oven, baking utensils and ingredients. Somehow, I always find new ways to give my credit card a workout! 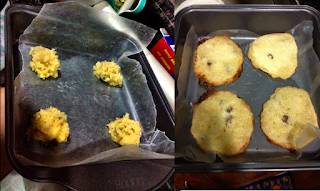 Last weekend, I tried the reverse of how not to bake chocolate cookies recipe. 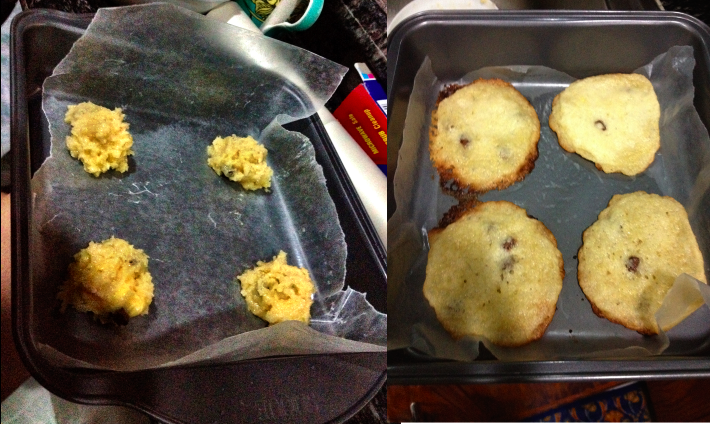 The cookies are yummy but it ended up too oily (too much butter) and hard instead of chewy (too much baking powder). So, as I walked around the grocery store, I was ecstatic to find an instant muffin mix! It feels like cheating but this is stepping back. I'll start from instant mixes before going back to following recipes again. The muffin mix! Too bad the choco cookies mix was out of stock! Add 3/4 cup of milk, yay I got to use the measuring cup! And put it in the muffin pan! The result, after baking it for 15-19 minutes! Im so happy! It tastes good, I even added chocolate bits for added surprise.